Attempting to paint glassware for the Everyday Matters weekly challenge. I obviously need to do more work! It seemed like a good exercise to work on mixing greys for the clear glass, although scan seemed to separate the colors so that the "stuff" on the left side of the top glass turned out blue. I haven't a clue what that is all about. 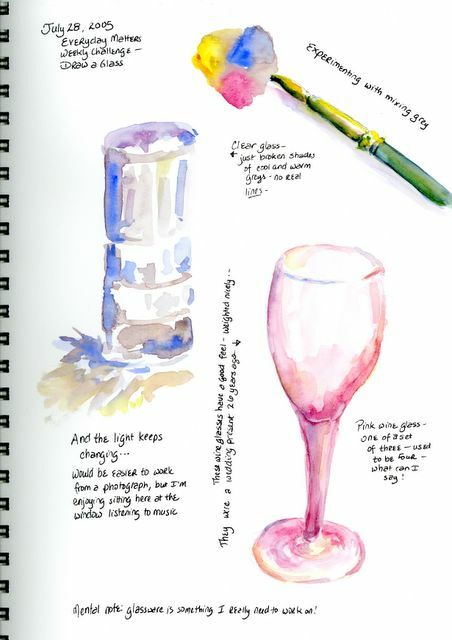 I'm also taking this scan as a lesson on a way to check for mistakes -- the inward WOBBLE on the right side of the wine glass was not at all obvious to me when I looked at the page -- on the scan it jumps out at me like crazy! I shall try to correct it, but am really tickled to see that the scanner is such a good composition, etc tool. The light also kept changing, which made the reflections, highlights, and shadows change -- perhaps glassware is best done from a photograph or under artificial light. I refuse to move further away from the window though, so there! I'll admit, also, that my heart just isn't into this challenge since my mind is still focused on fruit. Peaches and cantaloupe are calling my name still, as are the sunflowers DH brought home from the grocery store last night. Serious study of glassware will just have to wait. Best glassware I've seen so far from the EDM challenges just HAS to be Laura's at Laurelines, both her stuff for the challenge itself and her post a few days earlier about her gourmet husband's breakfast cooking. I keep asking her if I can borrow her DH one weekend for Sunday brunch, but she refuses. I guess I'll have to keep living vicariously through her blog! We got to spend last weekend on the boat - Just Loverly - and I haven't drawn much since the rest of the week was spent catching up on neglected chores. A friend and I were talking the other day about our southern phrases, and we were joking about how in the south you can say anything, no matter how terrible, about someone, and then finish the slam with "bless her heart", which makes it all okay. That's a long standing joke about southerners, but it is really and truly true! The phrase is sometimes used to imply deep sarcasm. The coffee maker blew up the other day, and at the big electronics / appliance store we saw a refrigerator with flat screen TV in the door. Yes. You read it right. In the door of the refrigerator. This means that you don't even have to get up during commercials to get a snack. For some reason, this just blows my mind still. I reckon some people probably feel like they NEED a refrigerator with a TV build into the door, bless their hearts. New CD for this month: Israel Kamakawiwo'ole "Facing Future" It's a fun summertime listen -- wa-a-a-y mellow! A quickly done little peach sketch. I didn't let the washes dry before proceeded to the next -- the peaches were turning brown before my eyes and they smelled so GOOD! 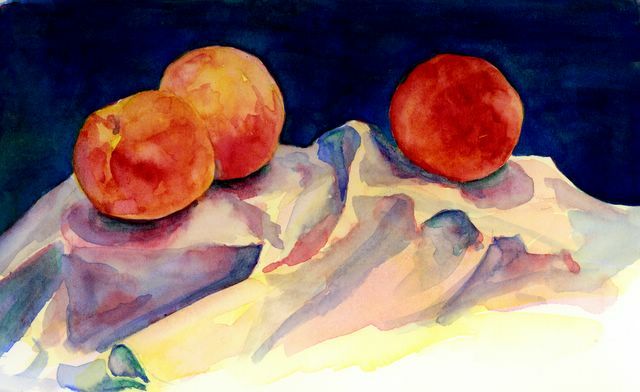 Peaches, which are a naturally good subject for practicing with transparent watercolor. 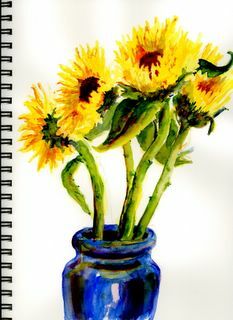 I got these to paint (yeah, right -- only to paint!) and then lucked out, because the Everyday Matters weekly challenge this week was FRUIT! I set these guys up on a shoe box covered with a white dinner napkin and a black notebook propped up behind them to get rid of background distractions, and went to work. For once I'm on time on a challenge! I'd wondered in the previous post what advantage there could be in using non-staining (lifting) pigments for glazes. I think it works pretty well for peach fuzz, although I did a final layer in Alizarin Crimson, which is staining. I don't really care for the napkin folds, although I didn't really focus too much on them; I especially don't like the yellow on the bottom left fold. The background is layer after layer of staining pigments, and I'm considering doing another layer of ACrimson, but I'm not sure. Anybody with any ideas on that? Experimenting with lessons from Jeanne Dobie's book, Making Color Sing. I read this book about 20 years ago, I guess when it first came out, and remember it being one of the most instructive watercolor books I'd ever seen. 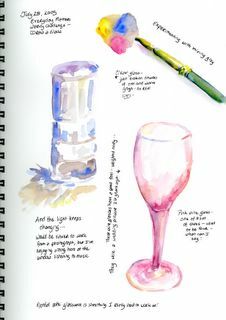 The other day, I checked it out from the library again, and, after re-reading the whole thing, decided to go through the lessons with a watercolor pad one at a time. At the beginning of the book she really emphasizes using transparent non-staining pigment (aureolin, rose madder genuine, cobalt blue, and viridian). 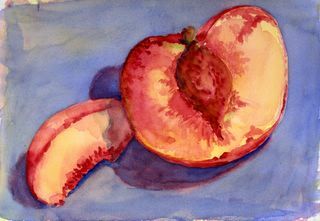 I tried doing this in pretty much those colors alone, but have had trouble in that the underlying layers of paint lift off anytime I try to darken any of the passages. The horrible blue on the side of the little building was supposed to be a nice cool grey glaze, but it kept coming out whatever color I glazed on top. 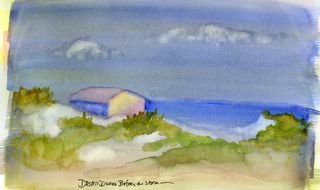 I never could get the grasses on the dunes right, and finally, in utter disgust, mixed in a little quin gold. I won't say this is the worst watercolor sketch I've ever done, just the worst I've ever let anyone see. My question is, what is the point of glazing with non-staining pigments if you aren't planning on lifting off, and how in the world do you keep it from lifting off when you work the subsequent passages??? 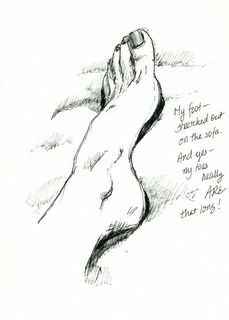 This week's challenge for the Everyday Matters group is to draw your foot. Not the prettiest of subjects in some cases, mine included! All the responses to the challenge were good, but Deborah's at "It Was This Big" (her July 14 post) was my favorite, and she wins the best perspective prize as far as I'm concerned! Catching up on old Everyday Matters challenges. This one was to draw an item of clothing. 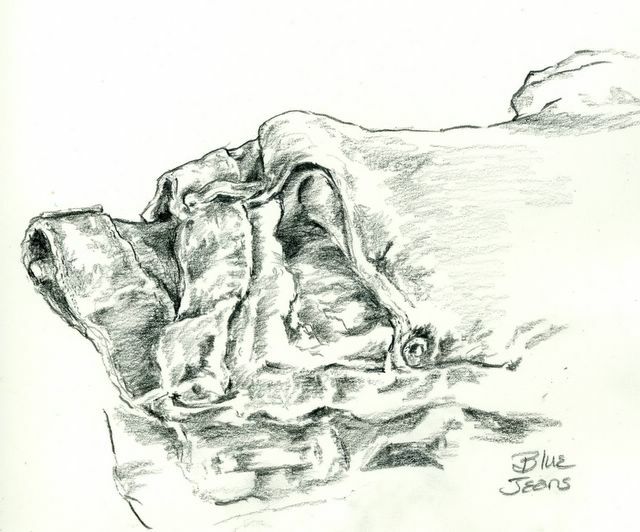 My blue jeans were lying on the table, folded, just out of the dryer -- what better item of clothing to draw! Everyday Matters Weekly Challenge: Draw something old. I have a very old quarter-sawn tiger oak writing desk that is just one of my favorite pieces. These are a couple of details of a drawer handle and a bit of the carving on the drawer. I kept getting distracted by a vase of hydrangeas sitting nearby, and decided that since they were an old fashioned flower after all, it would be okay to add it to the page. 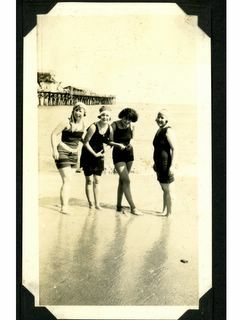 The photo is from a scrapbook of my grandmother's dated from the autumn of 1925 to the spring of 1926. 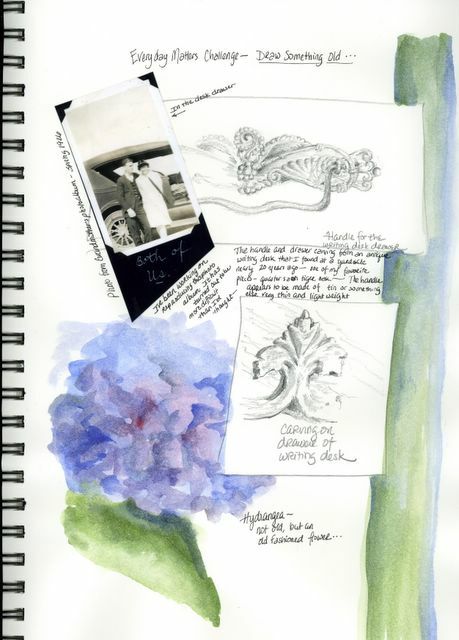 We found the scrapbook several years ago after she died, tucked away in a closet. She and my grandfather were dating at the time she made the scrapbook, and the book is full of photos of their "gang" of friends. 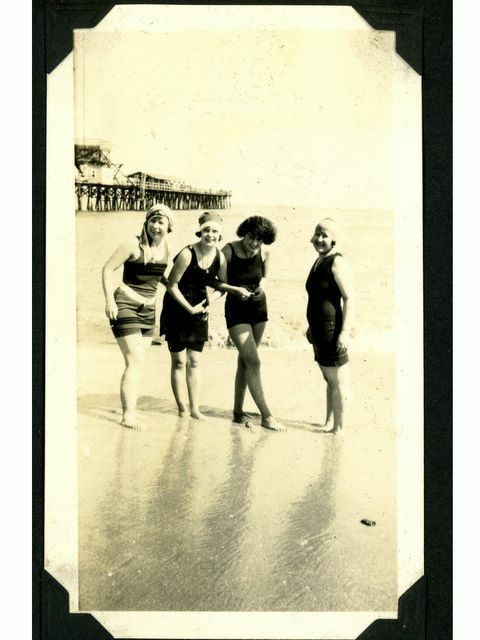 I don't know why she never shared it with us -- did she think that she and her friends acting up and having fun would have made us take her a little less seriously? Did she just forget about it? Did she think we wouldn't be interested?